Summary: The methodology employed in Genesis points unequivocally to Day Three being an account of the formation of heavier elements in the stars and supernovae, and the almost simultaneous emergence of the first primitive life forms, the organic building blocks of life. Day Three of Genesis continues the methodology applied in the first two ‘days’. The methodology sets out a series of transformations of the state of the universe from the initial matter and space described in Day One, to the final cosmic ‘product’ in Day Six – the human organism. From this “beginning”, Genesis applies a methodology of transformation to explain the universe and life as we know it today. “The heaven and the earth” refer to the original, and only, material that was created which would be used to create the universe and life; “earth” symbolizes matter, and “heaven” symbolizes space (where the matter was). Everything else in the universe, including life, would be created from this original matter and space through a series of transformations. That is why they are then collectively re-described as “the waters,” symbolizing their latent life-creating properties. “The waters” are then transformed into “light”, which is “divided” from “the darkness.” The “light” and the “darkness” symbolize the matter and energy created by the transformation of the original (exotic) matter following the initial inflationary expansion and Big Bang. “Light” was created when matter (particles) and anti-matter (anti-particles) collided to create photons of light. But since there was a slight excess of matter over anti-matter, some matter remained; Genesis calls this excess matter “the darkness”, which comprised both visible and dark matter. Visible matter, at this early stage of the universe, comprised mainly hydrogen and helium, with traces of deuterium and lithium – the lighter elements. To emphasize that the initial transformation of matter had been made “permanent, regular, and in a settled order”, God is said to name the transformed matter, always with a capital letter: “And God called the light Day, and the darkness he called Night.” Day refers to the photons of light, and Night refers to the dark and visible matter. At this stage, it means that a number of crucial cosmic numbers had been “finely tuned” (as Rees describes it) to ensure that the next step in the process can proceed on a fixed and firm foundation. In particular, the number Ω (omega), which measures the amount of matter in the universe. If the amount of matter had been more, the universe would have collapsed in on itself; if less, it could never have formed into stars and planets. A significant part of the quantum world had been transformed into the Classical (Newtonian) world. The process of inflationary expansion had also forced the initial matter into motion, thus starting the cosmic clock. Time had begun, signified by the words “And the evening and the morning were the first day.” Maimonides suspected that time related to motion. He said, “God created the Universe from nothing; that time did not exist previously, but was created: for it depends on the motion of the sphere, and the sphere has been created.” Of course, at this stage, time didn’t depend on the motion of a sphere; it was a consequence of the motion of matter expanding through space as a result of the initial inflationary burst and Big Bang. Cosmic time is measured from that moment. Day Two begins by again re-describing “light and darkness” collectively as “the waters,” signifying their life-creating properties, even though, at this stage, they comprised only photons of light, and visible and dark matter. And visible matter still only comprised hydrogen, helium and traces of deuterium and lithium, the lighter elements. God is then said to insert a “firmament” into the “midst of the waters, to divide the waters from the waters.” Firmament means, literally, expansion. An expansion was thus to “divide the waters from the waters”. The interaction of gravity attracting particles in the denser regions of space, and Expansion pushing the denser regions of space apart, caused matter to ‘cluster’ into enormous protogalaxies, leaving large areas of space between them. What was left between the newly forming protogalaxies was called “Heaven”, or what Rees calls “voids,” commonly described as the sky, or space. However, “the waters” had not finished their work. But they had, by the close of Day Two, perfectly configured the universe to begin the task of creating the heavier elements and the building blocks of life. That is done in Day Three. The first part starts with this. There appears to be a curious omission right at the start of Day Three. When God is said to command that “the waters” be “gathered together unto one place,” it is only “the waters that are under the heaven” that are gathered together. So what happened to the rest of “the waters,” those that were “above the firmament” (verse 7)? Once the expanding matter had formed into clusters (protogalaxies), leaving vast “voids” between them (what Genesis calls “Heaven”), all the clusters are under the voids in the sense that they are surrounded by ‘empty’ space. In other words, “the waters” that were previously described as being “under” or “above” the expansion, all ended up surrounded by empty space once expansion and gravity had done their work on the density differences of matter. Looking up at the heavens from any cluster in the early universe would have felt like being under the void of space, just as it does today when we look up at the sky from planet Earth. Therefore, none of what had previously constituted “the waters” had changed; it had simply formed into clusters scattered across the expanding universe, separated by voids of space. All “the waters” still constituted the lighter elements of hydrogen, helium and traces of deuterium and lithium. Unfortunately, neither Nahmanides nor Maimonides can help us understand what these verses mean. That is because they both assumed that all the elements were created on Day One. They adopted the consensus of the time that the elements comprised air, earth, fire and water. As a result, they assumed that reference to “the waters” in Day Three must have meant water in the sense of liquid water. The arguments put forward in this series of articles adopts the “method” referred to by Maimonides of the original elements undergoing a series of transformations resulting in the universe and life as we know it. The only difference is that, with modern atomic theory, science has a better understanding of what elements were created by the Big Bang, and how subsequent elements were created. By applying that approach in the context of the methodology adopted in Genesis, Day Three exactly reflects the modern scientific understanding of the cosmic processes that created the heavier elements, and the building blocks of life. Atomic theory was first proposed by John Dalton in the 1800’s and subsequently developed by others such as Ernest Rutherford and Niels Bohrs. In the 1940s, the Russian physicist (turned cosmologists), George Gamow, discovered ‘nucleosynthesis’, which explained how nuclear reactions created the lighter elements like hydrogen and helium. Gamow believed that all the elements were created by the intense heat of the Big Bang. However, the calculations didn’t add up. His calculations worked for the lighter elements of hydrogen, helium, deuterium etc, but not for heavier elements. The Big Bang didn’t produce sufficient heat. Day Two concluded after the lighter elements of hydrogen, helium, lithium and deuterium had formed the “first protogalaxies”, but before the formation of stars and supernovae. Therefore, if the methodology employed in Genesis is adhered to, the first part of Day Three can only be referring to the consequence of the “protogalaxies” forming the heavier stars and supernovae. The symbolism of Day Three exactly reflects that process. The “waters under the heaven” symbolize the “first gaseous condensations” that had formed across the universe as a result of gravity and expansion acting on the density variations in the expanding universe. At this stage, “the waters” consist only of the lighter elements of hydrogen, helium, deuterium and lithium. The methodology employed in Genesis doesn’t permit any other reasonable interpretation of the first part of Day Three. This is the last time in the creation story that the naming of what had been created takes place. The names given here are “Earth” and “Seas” – and, as usual, this naming is with capital letters. As already noted, this signifies another stage in the transformation of the state of the universe that Genesis started with – “the heaven and the earth.” And there is good reason that this is the last occasion that the naming takes place. Day Three clearly refers to a generic situation across the universe, in which many areas were experiencing the same thing, even if at different times, and the process was repeating itself forging all the natural elements. The elements were being created across the universe, not just in our galaxy, or even our solar system. In fact, according to Genesis, our solar system only starts taking shape in Day Four. However, its origins are in Day Three. And just as the original “heaven and earth” clearly did not refer to the sky and planet Earth, likewise it is clear that neither do “Seas” and “Earth” refer to planet Earth and its oceans. The naming here highlights the fact that all the necessary cosmic ‘structures’ and ‘ingredients’ had formed into the required configurations to begin the process of creating the intended cosmic product – life. The quantum world had been transformed into the Classical (Newtonian) world. The observation establishes an “irreversible effect” in respect of everything that had been created up to that time, and would be created in the future by the same processes. And that “irreversible effect” establishes what we recognize today as Classical physics. It explains “how the fundamental laws of quantum physics morph[ed] into the classic laws,” thus enabling us to predict with such certainty how inanimate objects behave. It provides a stable and predictable macro-world of planets and stars which operate according to laws – laws that are symmetric across the universe. The universe becomes a cosmic factory; the stars and planets become cosmic machines; the elements are the cosmic ingredients; and the laws of physics and chemistry provide the cosmic instructions on how everything operates. Thus, the process of creating the intended cosmic product was ready to begin. And there is good reason that this initial process was included in the same ‘day’ that the heavier elements were created. The first thing to note in these verses is that nothing is named – there is no mention of the words “And God called …” We have already seen why that should be – all the structures and materials necessary to create life were in the required forms and quantities, and the laws that determine how they behave (their fundamental chemical and physical properties) had been imprinted into the universe. God is not said to create what is to be made Himself; instead, He ‘delegates’, so to speak, “the earth” to produce the grass etc. But what exactly constitutes “the earth”? The methodology employed in Genesis re-describes the state of the universe immediately preceding the next stage of transformation with a word that encompasses the totality of the material at that time, but which also conveys a sense of the intended future purpose of the transformation that is about to take place. Up until this stage, “the waters” symbolized the various states of transformation to signify the latent life-creating properties of the material that was being processed. But now the process of making the intended product itself is to begin – life. And it is for all the material that existed at that time, with its newly acquired properties, to initiate the process. The meticulous methodology can only mean that the words “Let the earth bring forth” refer to the whole state of the universe as it existed at that time. That is, the stars and supernovae which were producing the heavier elements and dispersing them throughout space, symbolized by “the earth,” would also now initiate the process to creating life. But why call it “the earth” rather than “the waters”? First, because “the earth”, in the sense of planet Earth, would be composed of all the elements that were being forged in the stars and supernovae, and would thus have both liquid water and dry land. The word “earth” more effectively conveys the message that what was to “bring forth” life included what had previously been symbolized by both the “Seas” (the lighter elements) and the “Earth” (the heavier elements). The building blocks of life would require a perfectly balanced mixture of elements to transform into the intended final ‘products’ once it encountered a conducive environment; and that environment would be planet Earth, and other such ‘goldilocks’ planets that may form throughout the universe. Secondly, the word “earth” relates not just to the state of the universe that was to initiate the process of creating life; it also reveals what kind of environment the precursors for life will encounter in the future, thus enabling it to configure accordingly. That is made clear by the repetition of the word “earth.” The “earth” is to “bring forth” grass etc, “whose seed is in itself, upon the earth.” The “earth” that is to “bring forth” life refers to the state of the universe at that time (stars and supernovae); and the life it is to bring forth is destined to be “upon the earth” (planet earth), and is configured accordingly. The description of this process conforms with the principles of quantum mechanics, and the implications of the ‘delayed-choice’ experiments explained in the article on Day One. These experiments into the quantum behavior of particles show that particles adjust their configuration in anticipation of the future environment they will encounter. They can even ‘know’ what that future environment will be before it exists, and prepare accordingly. These verses in Genesis, in which the word “earth” conveys a dual meaning, perfectly reflect the quantum mechanical model. The ‘destination’ “earth” (planet earth) is the environment (situation) the precursors to life will “encounter farther downstream”; that is ‘communicated’ to the material that will configure itself into the required life, symbolized by the words “And God said …”; then the “earth” (the state of the universe at that time) configures the elements to form (“bring forth”) the chemical structures (organic precursors) that will form the intended products (grass, herb yielding seed and the tree yielding fruit). That interpretation must be correct, because when the things that “the earth” (stars and supernovae) was to “bring forth,” which would be “upon the earth” (ie planet earth – verse 11), are in fact “brought forth” (verse 12), there is no mention of them being “upon the earth.” The reason for that is clear – the planet earth (their ultimate destination) had not yet been formed. The next thing to consider is what exactly is meant by “grass, the herb-yielding seed, and the fruit tree yielding fruit after his kind, whose seed is in itself”? It would be an uncharacteristic departure from the meticulous methodology applied by Genesis if it suddenly jumped from stars and supernovae creating elements, to grass and plants as we see them outside our windows today. But if these references to grass, plants and trees are meant to be symbolic, like “the heaven and the earth” and “the waters”, then what are they supposed to symbolize? Genesis is telling us that the basic structures of elementary life had been created, but that they had not yet developed into any identifiable type of life. It needed something to enable it to ‘grow’ into what it was ‘programmed’ to be. And verse 5 tells us that what was lacking was the right environment. Clearly, Philo believed that these verses qualified the account of creation set out in Genesis 1. Day Three suggests, therefore, that only primitive DNA (or its chemical precursor) had been created, and that it was created at about the same time as the heavier elements were created in the stars and supernovae. DNA comprises five main elements – carbon, oxygen, hydrogen, phosphorus, and nitrogen. And apart from hydrogen, all these elements were created in the heavier stars and dispersed throughout the universe in supernovae explosions. According to Rees, “the debris thrown back into the space [following a supernova] contains a mix of elements. Oxygen is the most common, followed by carbon, nitrogen, silicon and iron.” And, of course, that “debris” would also include phosphorus, and other elements. This means that the elements necessary to construct DNA were being produced by such processes across the universe. There is certainly a great deal of evidence that life-forms exist throughout the universe, and were created in the stars. And the evidence is growing stronger by the year. In 2014, Quanta Magazine reported the Jeremy English, a physicist at MIT, proposed that life was a natural consequence of the second law of thermodynamics. The “new theory … proposes that when a group of atoms is exposed for a long time to a source of energy, it will restructure itself to dissipate more energy. The emergence of life might not be the luck of atoms arranging themselves in the right way, it says, but an inevitable event if the conditions are correct.” Although English doesn’t suggest that this process takes place in the stars, if his theory is correct, stars would seem to present the ideal conditions for atoms to restructure to form organic compounds. These are only a few of the many findings of ‘life from space’. With missions to Mars and Saturn, it is likely that even more surprises may be in store for us. But what this evidence shows is that the Genesis account of when life was first ‘created’ is turning out to be very accurate. Even into the 1970’s, biologists were absolutely convinced that life could not exist without sunlight. That has been proved to be wrong. Until even more recently, the notion that life may not have evolved on Earth met with ridicule. But the evidence is starting to point in precisely that direction. If the evidence does keep building up, as Wainwright says, “we [will] have to completely change our view of biology and evolution.” And perhaps scientists will have to give at least a grudging acknowledgement to the author/s of Genesis for having ‘known’ all this many millennia ago. Accordingly, at the end of Day Three, the universe has been transformed into a cosmic factory, with cosmic machines; it has an abundance of cosmic ingredients together with a cosmic recipe; and we get the first glimpse of the intended cosmic ‘product’ – life. Day Three takes the universe to a time shortly before the formation of our solar system, which is about 4.6 billion years old in earth time. That means that by the end of Day Three the universe must have been about 9.2 billion years old. Deducting the time for the first two ‘days’ (about 1 billion years), Day Three would have covered a time span of about 8.2 billion years. From Day Four, Genesis focuses in on our solar system, although the processes that take place are just as likely to have occurred (and perhaps continue to occur) in other solar systems scattered across the universe. Although, as we shall see, not the human organism in its physical form, but as DNA with the necessary properties to form the physical being when it encounters the right environment. Weinberg, Steven. Dreams of a Final Theory, Vintage, New York, 1994 (paperback), page 6. Weinberg, page 61. Emphasis on principles is his. Nahmanides, 1:1 at Para 3. Rees, Martin. Just Six Numbers, Phoenix, London, 1999 (paperback), page 145. Greene, Brian. The Fabric of the Cosmos, Penguin, London, 2005 (paperback), page 305. Nahmanides 1:1:3 & Maimonides II:30. Kaku, Michio. Parallel Worlds, Penguin, London, 2006 (paperback), page 62. Rees, pages 122 – 123. See Greene, page 22, for an explanation of translational symmetry. For the article on which this video is based, click here. cosmologycreation.darknessexistence of GodGenesis Day 2lightNahmanidesphysicsquantum physicsScienceuniverse. There is a curious but crucial omission in Day Two of Genesis that appears in each of the other Days; only in Day Two are the words “And God saw …” missing. But as this video explains, that is not a clumsy oversight, it is very deliberate; and it reveals a profound understanding of the scientific origins of the universe. To understand why, we need to examine two important elements of the story: the methodology employed in Genesis, and the original meaning of the word that is translated “firmament” in the English version. Day One started with “the heaven and the earth”, which were described as being “without form, and void; and darkness was upon the face of the deep.” The “earth” clearly refers to matter, while “the heavens” refer to space. Matter is perfectly described as being “without form, and void,” and space is accurately described with the words “darkness was upon the face of the deep.” That is a description of what physicists today call a gravitational singularity. The “waters” are then ‘converted’ into “light” when matter and antimatter interacted to create photons of light. But because there was a slight excess of matter over antimatter, some matter was not converted into light. That excess matter was described as “the darkness”, which was separated from the “light”. This excess matter would form the building blocks of the universe. Everything that exists in the universe, or will ever exist, is made up of this initial matter and energy (light). It is precisely at that point of Day One that Genesis says there was an intervention: “And God saw …” An observation was made that created the “irreversible effect” that guaranteed that there would be enough matter in the universe to build everything we see around us today. Now some people may claim that this is a rather ‘creative’ interpretation of Day One of Genesis, but it is in fact based on a literal reading of the words in the original Hebrew. And that is confirmed by the great Jewish scholar Nahmanides (1194 – 1270 AD), also known as Ramban. And we should remember that he was commenting on Genesis some 700 years before scientists had any real idea of the origins of the universe. That description perfectly conforms to modern cosmology. Furthermore, as we saw in the video on Day One, that is the basis of the mathematical equation – how a substance can change into something else while maintaining its intrinsic value, like the most famous equation of all, E = mc2. So at the end of Day One, Genesis tells us that the universe was composed of light and darkness, which means photons of light and the excess matter that was not converted into light because there were no antiparticles to pair-up with. And we know today that these particles formed the first lighter elements. Accordingly, at the start of Day Two, the embryonic universe would have contained about 75 percent hydrogen, 23 percent helium, and traces of deuterium and lithium. The Big Bang did not generate enough heat to create the heavier elements needed for life. But if “the waters” were already in different places, that must have been a consequence of Day One, and Day One was about quantum physics. This was a result of the interaction of gravity and what physicists call today expansion. Expansion was and still is crucial to maintain the universe in the way we see it now, and for the creation of life. And Genesis recognized that. The word that is translated “firmament” in Day Two is actually raqiya in the original Hebrew, which means expansion. So suddenly Genesis reads exactly like the modern day scientific understanding of the forces that created the universe, and especially this crucial expansion force that was the cause of the formation of galaxies, stars, and ultimately life. Without it, the universe would not exist. But did the reference to expansion in Genesis actually refer to what science calls expansion today? On the ‘best evidence rule’, the answer is yes. And that is again confirmed by Nahmanides. But why no reference to the words “And God saw …”? At this early stage, the universe consisted of giant protogalaxies composed only of the lighter elements, so it was essential that the state of the universe should not yet be made “irreversible,” and as we saw in the previous video, the words “And God saw …” does precisely that. The protogalaxies had to continue to condense, forming giant stars whose incredible density would create supernovae, because it is this process that creates the heavier elements necessary for life. Omitting any reference to “And God saw …” shows that Genesis understands the importance of the universe taking its course before being ‘locked-in’ with an observation. The observation comes in Day Three; in fact, there are two observations in Day Three, and for good scientific reasons. So by the end of Day Two, everything was in place for the next step towards the ultimate purpose behind the universe – the creation of heavier elements, and ultimately human life. These are the issues addressed in this video. This series of videos is based on the book A ‘Final Theory’ of God by Joseph BH McMillan. References are to the King James Version. Rees, Martin. Just Six Numbers. Phoenix, London 2000, page 145. Green, Brian. The Fabric of the Cosmos. Penguin, London 2005, page 305. Rees, page 119, emphasis is mine. Greene, page 321, emphasis is mine. Greene, page 318, emphasis is mine. cosmologycreation.darknessexistence of GodGenesis Day 2http://wp.me/p5izWu-bslightNahmanidesphysicsquantum physicsScienceuniverse. A Legal Proof for the Existence of God (Part VII): Science in Genesis – Day Six. Day Six is an account of the ‘programming’ of human DNA to form the neurological structures in the brain that give us the ability to distinguish between right and wrong. It explains why the human brain has three distinct faculties – morality, reason and instinct. The interaction between these neurological faculties is what accounts for human consciousness, the human quest for knowledge and justice, and why, as we saw in the introductory article, science, philosophy and religion all reveal the search for a Supreme Law and a Supreme Lawmaker. Unfortunately, it also accounts for the human capacity for almost perpetual conflict, and our ability to visit upon our fellow human beings the most unspeakable atrocities and degradations. However, the human propensity for violence is an inevitable consequence of the interaction between these neurological faculties when the moral faculty is dysfunctional. We should recall, however, that at the end of Day Six, human beings did not yet exist in physical form. That is clear from Genesis Chapter 2, verses 4 to 7, as explained in the articles relating to Days Three and Five. To understand why the creation of land animals is in Day Six, rather than Day Five when the other creatures were created, we need to briefly review how Genesis accounts for the creation of life. As we saw in Day Three, primitive DNA was created in supernovae which then “seeded nearby nebulae.” This DNA had the basic attributes of life which provided for its survival and reproduction – “whose seed was in itself.” However, the scientific evidence is now showing that atoms can form into living organisms when they encounter the right environment. And since DNA is simply a more complicated structure of atoms, it follows that DNA must also be susceptible to transforming into more complicated structures under the right conditions. We saw in Day Five how research by Jeremy English, a physicist at the Massachusetts Institute of Technology (MIT), suggests that this process takes place when atoms, or in this case DNA, is exposed to the right environment. Nevertheless, the environment that existed at that time was conducive to the primitive DNA transforming into more complicated DNA, and that is what Day Five tells us happened. The primitive DNA transformed into the DNA that would create the creatures of the sea and the air. Finally, we also saw in Day Five that scientists now know that what was previously thought to be Junk DNA in fact consists of genes waiting to be activated when the right environment is encountered, and with ‘switches’ to make that happen. 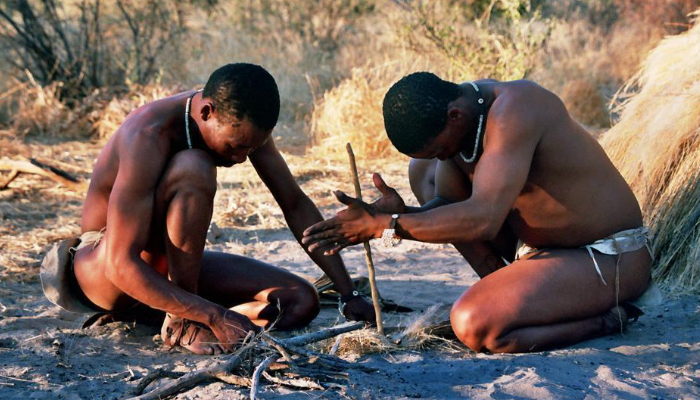 This account tells us how human beings acquired a capacity for moral judgment. It tells us that human DNA is programmed with an image of the laws that govern the universe, and that those laws reflect the Will of the Author of those laws – the Supreme Lawmaker we call God. By portraying humans as being created “in the image of God”, Genesis is telling us that human DNA was being programmed to adapt not just to the environment, but to the laws and will of God Himself. “Man” was to have a purpose beyond simply an ability to “Be fruitful, and multiply”. They would assume responsibility for those matters over which God Himself would otherwise have exercised power – hence the reference to “man” having “dominion” over all the other life that had been created. And “man” would be endowed with the tools to exercise that power wisely, if he chose to do so. But we should be careful not to consider the brain as a whole to be an “image of God,” because, as we shall see, parts of the brain are also used for other purposes – purposes, moreover, as far removed from anything resembling morality as we could get. So we are really talking about a particular element of the make-up of the brain that reflects the “image of God” – its moral faculty. This moral faculty is the manifestation of the moral dimension of the laws that were established at each stage of the creation process. Then there follows the actual ‘doing’ or ‘carrying out’ of the intention – “And there was light,” … “And God made …,” … “and it was so;” … “And the Earth brought forth …;” and so on. It is this latter wording that brings the laws of physics and the laws of morality together. The final convergence of the various intentions, makings and observations, reflect the intention of the Creator who initiated and conducted the whole process. In other words, the universe is an expression of God’s Will which reveals itself in the laws of physics. And the ultimate manifestation of that will, and those laws, is a human organism endowed with a capacity for moral judgment. That means that the “image of God” must be reflected in some physical structure within the human brain which is a “likeness” of God. At the very heart of any notion of morality lies the relationship between two people, a man and a woman, and their joining together to create new life – a new human being which is in their genetic ‘image and likeness’. As we saw in the first article, creating a new human life attaches onerous obligations to those two people who, by their own voluntary act, create that new human life. So the concept of “male and female” has always had moral implications, and those moral implications also relate to the creation of the universe itself. But why does verse 26 refer to God in the plural? It is the only place in the creation story where that is done. The answer can only lie in the various means God is said to employ in the creation. As we have seen, Genesis starts with “In the beginning God created the heaven and the earth.” Everything that was to be created thereafter was to come from these two things – in scientific terminology, matter and space. In the Christian tradition this is called the Holy Trinity – God the Father, God the Son, and God the Holy Ghost. Philo has a slightly different interpretation. His argument is that since God can only create that which is “good”, and since certain elements of human nature are not “good”, God had to resort to “assistants” when it came to creating human beings. But he doesn’t say who God’s “assistants” might be. I don’t think Philo’s interpretation is correct, because, as we shall see, those elements of human nature that Philo says preclude God’s involvement are not in themselves wrong. In fact, they are essential for human survival: they are human instinct, and human reason. It is only when reason is applied to the primary or exclusive service of our primitive instincts that the actions become wrong, or evil. Furthermore, when it comes to ‘programming’ human DNA with reason and instincts, God is not said to have resorted to “assistants” – He does it Himself. So the “image and likeness” of God can only refer to human DNA being endowed with the capacity to perceive the moral dimension of the fundamental laws that govern the universe. The “image of God” is the moral dimension of the laws that govern the universe which are imprinted into our brains in mathematical form, and the “likeness” of God is the neurological network that enables us to convert that raw mathematical data into moral concepts. That tells us that if human DNA has a moral component, then that moral component can only be a consequence of the moral dimension of the “equations of quantum mechanics” which, as we saw in Day One, are the equations that establish freedom as the foundation of the laws that govern the universe. But it also establishes freedom as the fundamental principle of morality, which is modified by its reciprocal negative obligations, as well as those additional positive obligations that are imprinted into our brains and evidenced when we create new life in our own image. That accounts for the moral faculty that is imprinted into the brain. The next verse accounts for reason and instinct. It is verse 28. We need to separate this verse into that part that refers to reason, and those parts that refer to human instincts. First, we should note the difference between how God is said to have spoken to animals compared to humans. In the case of animals, Genesis uses the word “saying”, whereas in the case of humans the words used are “said unto them”. The words “unto them” clearly denote a greater level of understanding between the one doing the speaking (God) and those He is speaking to – the “male and female”. These words symbolize human DNA being ‘programmed’ with a considerably greater ability to reason, as well as superior communication skills. Talking to someone is very different to simply saying something. As we saw in the example given in respect of Day Five, one version is like ‘saying’ something to your pet dog, whereas the other is like talking to your children. Here the words are even more explicit. They depict an ability on the part of the humans to understand what is being explained to them. And that requires a capacity to reason. There can be no other explanation for the different use of words depicting the communications God is said to have had with humans and with animals. As explained in respect of Day Five, these words relate to the instinct to reproduce, and the instincts for survival and security. These are the instincts we share with animals. And other, rather unattractive, instincts derive from these instincts, notably the instinct for vanity. However, according to Genesis, God saw fit to endow humans with a number of additional instincts. The key words said to have been spoken to “man” are “subdue” the earth, and “have dominion over” everything else. These words symbolize human DNA being ‘programmed’ with the additional instinct to conquer. This instinct leaves most human beings with a strong desire to impose their authority and control not just on their environment, but on other human beings, as a means of suppressing the fear of death and insecurity that fires the instincts for survival and security. That is because the ‘instruction’ to “subdue” the Earth did not include a prohibition against subduing other human beings, and mostly it is other human beings that are perceived as the greatest threat to survival and security, often with good reason. Furthermore, the instruction to “have dominion” applies to “every living thing that moveth.” And human beings are such living things. It is this instinct to conquer that Nietzsche called the “will to power”. However, not exempting other human beings from the consequences of these primitive instincts was not some ‘slip-up’ on God’s part. It was required in order to ensure that a fundamental element of God’s Law was preserved – freedom. So we see that our instincts are not in themselves wrong or evil. They are necessary for our existence as a species. It is only when we employ reason to service those instincts, without reference to morality, that they do mischief. Reason is susceptible to falling into power of our primitive instincts because our instincts are activated by pleasure and pain. For instincts to serve their purpose there must be some mechanism to activate them. And that mechanism is the fear of pain, and the expectation of pleasure. So reason devises ways to limit any expectations of pain, and to service the expectations of pleasure. And that is when things can get out of hand. Genesis does not end the ‘programming’ of human DNA with instinct. The next verses reveal that human DNA was also programmed with an innate knowledge of how the universe functions. These verses are a continuation of God speaking to the humans He had just created and, as such, relate to instinct. The portrayal of God explaining to the humans what they had been given, what they can eat, and what God had given to the animals etc, symbolizes human DNA being ‘programmed’ with an innate, but latent, knowledge of how plant and animal life functions, and the interrelationship between them. It symbolizes an innate knowledge of the laws of physics, chemistry and biology, and an ability to discover and understand those laws. It also gives human beings an instinct to do so. But again, when reason is in the service of this instinct, rather than in service to morality, the consequences are inevitably disastrous. Worse still, when reason is in the service of another instinct, like the instinct to “subdue”, but with the benefit of the discoveries made by the instinct for knowledge, like lethal weapons, the consequences are horrific. However, it is not just the instinct for knowledge that gives us the instruments for destruction and death that are dangerous. The instinct for knowledge that produces apparently beneficial technologies can be equally destructive when not regulated by morality. So the instinct for knowledge is not inevitably beneficial and benevolent. Its worth is measured by the extent to which it is directed and controlled by reason in service to morality. Likewise, reason is not an inherently beneficial and benevolent faculty. It is a neutral faculty. Reason in the service of instinct results in wrong and evil; reason in the service of morality results in good. It is also one of the reasons that science, religion and philosophy all reveal the search for a Supreme Law, and a Supreme Lawmaker. This observation is not just “good,” but “very good.” It was exactly what God had intended, it reflected His Will, and it was also His final observation. The next article will deal with the Garden of Eden, and Adam and Eve, to show how the activation of these various neurological faculties gave rise to human consciousness. It will introduce the reader to the descendants of those relatives of Adam and Eve who did not eat of the forbidden fruit. They are alive, and relatively well, right here on Earth today. Kaku, Parallel Worlds, page 67. Philo, On the Creation, XXIII (69). Mathew 19: 4 – 8. Philo, On the Creation, XXIV (74). The Guardian, 13 October 2005. Weinberg, Dreams of a Final Theory, page 32. Nietzsche, Beyond Good and Evil, para 36, page 48. Quoted by Martin Rees, Just Six Numbers, pages 11 – 12. In Day One we started with “the heaven and the earth”, which were described as being “without form, and void; and darkness was upon the face of the deep.” Then “the heaven and the earth” are re-described collectively as “the waters”. The “waters” were then ‘converted’ into “light” when matter and antimatter interacted to create photons of light. But because there was a slight excess of matter over antimatter, some matter was not converted into light. That excess matter was described as “the darkness”, which was separated from the “light”. This excess matter would form the building blocks of the physical universe. But we now find no mention of “light” and “darkness.” Instead we have reference to “the waters” again. Following the methodology, it is clear that “the waters” refer to what existed at the end of Day One – “light” and “darkness”. In other words, photons of light, and those excess particles that could not find an anti-particle to enable them to convert into photons. But there is a further aspect of “the darkness”. Physicists now know that there is also dark matter. They have no idea what it is yet, but it is evident because of the amount of gravity that would be required to create stars and galaxies. There is simply insufficient ordinary matter to create the necessary gravity. So “the waters” can only refer to both ordinary and dark matter, as well as the photons of light. And as we saw in Day One, water has always been associated with life. Without it, life as we know it could not exist. We now come to one of the many remarkable aspects of the origins of the universe according to Genesis. The original Hebrew for the word that is translated as “firmament” is actually “expansion.” The Hebrew is raqiya`, which loosely means to hammer out something small into something large. However, in the late 1970’s, the scientific concept of expansion was proposed by Alan Guth and Henry Tye. After that, Biblical scholars began to debate whether the word “expansion” in verse 6 could possibly relate to the scientific concept of expansion. And not surprisingly, the answers vary depending on the position being taken. In law, however, we have what is known as the Best Evidence Rule. It requires that the best evidence should be adduced in support of a case. So if the dispute relates, for example, to the construction of a word in a contract, the best evidence would be contemporaneous evidence of what the parties understood the word to mean, not what subsequent parties may claim it means in hindsight. Applying that rule to the meaning of “expansion”, the best evidence would be what early Jewish scholars thought it meant. Now that is quite unambiguous. Consequently we now have a very different reading of this verse. The “expansion” was to “divide the waters from the waters”. In other words, the “expansion” was to separate “the waters”, and concentrate the separated “waters” into different places. And that is precisely what then happens. This verse clearly suggests a pre-existing state in which certain parts of “the waters” were already in different places – “under” or “above”. That would have been a consequence of what happened in Day One. And Day One was about inflationary cosmology. Greene identifies one specific consequence of inflationary cosmology which was crucial to the formation of the universe as we now see it. So describing some of ‘the waters’ as being in different places – “under” or “above” – in relation to the “expansion,” perfectly corresponds to scientific theory. Without it, the universe as we know it, and life itself, could not exist. 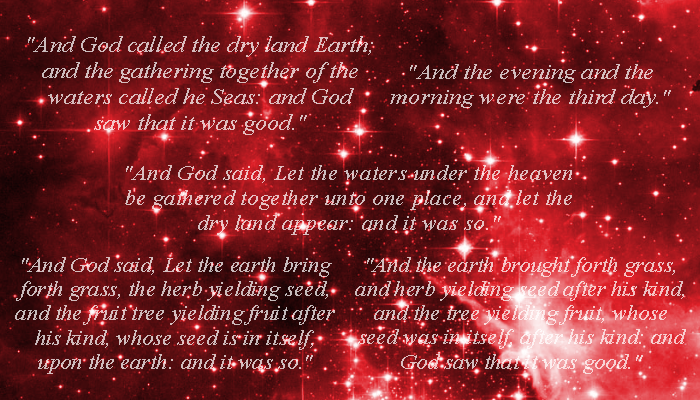 Genesis then brings the account of Day Two to an end, with God naming what He is said to have made. There is good reason for that. At this stage the “protogalaxies” that had formed contained only the lighter elements of hydrogen, helium, and traces of beryllium and lithium. The Big Bang did not produce sufficient heat to produce the heavier elements. That would require supernovae. However, since Genesis directly links the origin of life to supernovae, these two phenomena are dealt with together in Day Three. And remarkably, as we shall see in the next article, science is only now beginning to recognize this link. It was thus important that there should not be an observation at this stage. The process had to continue to the formation of supernovae before the state of the universe was ‘locked-in’ with an observation. But we do have the naming we had in Day One: “And God called the firmament Heaven.” As we have already noted, this naming (always with a capital letter) signifies a change from the state of the universe as at the start of the ‘day’. At the start of Day Two there were “the waters” into which was inserted an “expansion”. At the end of Day Two the “expansion” had divided “the waters”, resulting in what God is said to call “Heaven”. We should now recall what Rees said about the effect of the density differences in matter and energy in different parts of space: “slightly overdense regions, expanding slower than average, were destined to become galaxies and clusters; others, slightly underdense, were destined to become voids’. According to Rees’ depiction of the time-line of the universe, Day Two would have ended about one billion years after the Big Bang. So the “the evening and the morning” of Day Two were approximately one billion years less the 300,000 years for Day One. In the next article we will consider science in Day Three, and it may come as a surprise. Greene, Brian. The Fabric of the Cosmos, Penguin, London, 2005 (paperback), page 171 (emphasis in bold is Greene’s). Rees, Martin. Just Six Numbers, Pheonix, London, 1999 (paperback), page 121. Commentary on Torah, Genesis 1, Nahmanides, quoted in Gerald Schroeder Genesis and the Big Bang, Bantam Books, 1992 (paperback), page 65. Greene, page 309 – 310. Greene, page 307 – my emphasis in bold. Greene, page 311 – bold emphasis is Greene’s. Greene, pages 311 to 312 – bold emphasis is Greene’s. Rees, page 139 – emphasis in bold is mine. Rees, page 119 – emphasis in bold is mine. Rees, illustration at page 132.